You have just earned your degree, started working in your first OT job, and received your first paycheck. Your first instinct may be to treat yourself and buy that piece of clothing you’ve been eyeing for awhile, or a portion of their first paycheck towards retirement. In a survey conducted by GOBankingRates in 2016, they found that 1 in 3 Americans have $0 saved for retirement. Based on that statistic, there isn’t a better time than now to start investing in your future; but when it comes to saving for retirement, what’s the best option for you? As a new grad, I had no idea what my options were, let alone the best option for me. To assist in better understanding the gray areas of how to save for retirement as a new grad, I consulted with my personal financial advisor, Trevor Herin CFP, ChFC, a partner at Lifeworks Advisors LLC. For those of you who work full-time, or even part-time, your employer may offer a plan that allows employees to contribute a portion of their wages to individual retirement accounts. Most commonly in the OT field they are 401(k) or 403(b) plans. If the plan permits, the employer can make matching contributions to the employee’s plan. For example, if I were to contribute 3% of my bi-weekly paycheck to my 401(k), my employer would match that 3% bi-weekly. It’s money you’ll never miss. Meaning it comes right out of your paycheck before you ever see it. I think it’s harder for some of us to put money towards retirement if we see it coming out of our bank accounts every month. How much your employer will match differs from company to company, but typically the most common match is 50 cents on the dollar of up to 6% of your salary. If able, it is highly recommended to contribute enough to get the maximum match, otherwise you’re turning down free money. But what if my employer doesn’t offer a retirement plan? Don’t fret! There are multiple other retirement options. IRAs. The most common investment outside of 401(k)/403(b) plans are Individual Retirement Accounts (IRAs). These plans are taxed in the same way and invested very similarly. The biggest differences are that contributions are capped at $5,500 per year and your contributions come directly out of your bank account after taxes. There are also two different types of IRAs – traditional and Roth. The main difference between these two is when you pay income taxes on the money you put into the plans. Cash Value Life Insurance. This option is much safer compared to a plan invested in the market. Cash value life insurance is a life insurance policy that has a death benefit and also accumulates value in a separate account. Each time you make a premium payment for this type of insurance, portions of that payment go towards the cost of insurance, cash value into a separate account, and fees and overhead. Trevor recommends this option be used as a long-term savings option because of the up-front costs associated with the product. Individual Taxable Investment Account. This option can be invested similarly to 401(k)/403(b)’s and the client has access to the funds whenever they want with no penalties, but all gains are taxable. The difference between this option and an IRA is that there is NO contribution limit. Again, this is something Trevor recommends consulting a professional on to determine which option is best for you. I think I have a good understanding of my options: what’s the next step? Trevor’s number once piece of advice to new grads is to pay yourself first. This means that just because you’re making more money than you ever have in your life, it’s important to not let that drive your lifestyle – especially when you have debt, as most of us do. Pay off your fixed expenses (rent, utilities, groceries, cell phone, etc) first, followed by loan payments/savings/retirement, THEN entertainment. The best thing I did as a new grad was seeking a financial planner. My employer at the time didn't offer retirement options until I was with them for a year, but I knew that starting to save was important and I had no idea what my best options were. I hesitated for a long time because I thought that a financial planner would either charge me for his/her time or push different plans on me – neither of which ended up happening. Trevor has worked with many different individuals in the healthcare industry and often compares financial planning to a check up with your doctor. If your doctor tells you to make a change in your diet to make you healthier, typically, as healthcare professionals ourselves, we listen. If someone wants to be healthy when it comes to their finances, they should seek the help of a financial planner. The industry has become more and more complex and trying to do it on your own is risky if you’re not extremely knowledgeable in what you’re doing. 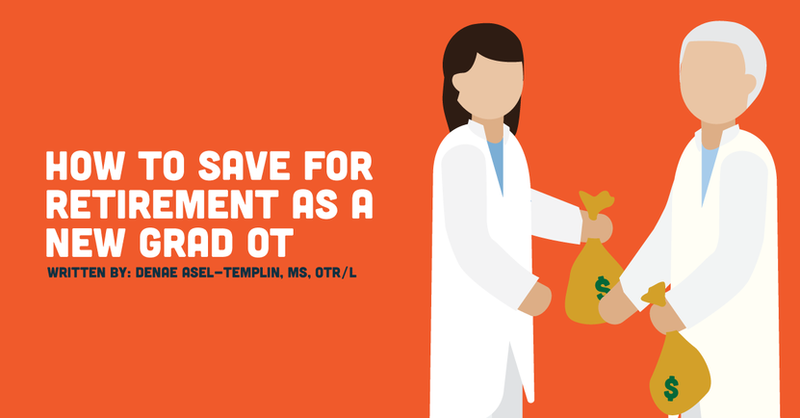 As OTs we are constantly caring for others, whether it be professionally or personally, but it’s important to remember to take care of ourselves too, and part of that involves making sure we are investing in our futures and ensuring optimal financial health.